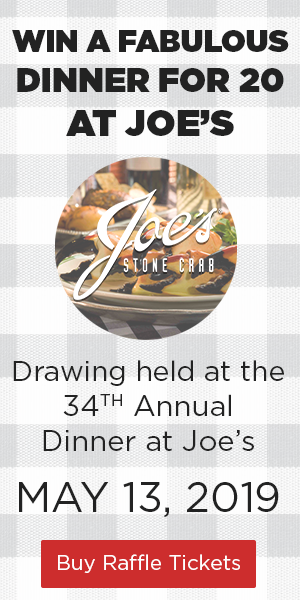 Who can resist sharing a dinner of Joe's Stone Crabs alongside family and friends? The annual Informed Families Dinner at Joe’s is an event with NO waiting and no boring speeches; just good friends and families who want to help kids grow up safe, healthy and drug free! 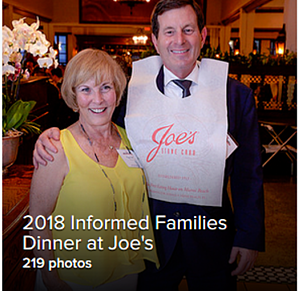 We invite you to join us at the 34th Annual Informed Families Dinner at Joe's Stone Crab Restaurant on Monday, May 13, 2019. This year's Joe's Co-chairs are Donna Abood and Michael T. Fay of Avison Young. The Informed Families dinner at Joe’s brings out Miami’s best families. Will you be part of this year's festivities? To review sponsorship options, please visit the sponsor page. For more information, please contact Milly Davila at Edavila@Informedfamilies.org or 305-856-4886. Miami’s finest gathered for Informed Families/The Florida Family Partnership’s 33rd Annual Dinner At Joe’s, showing their support for preventing drug problems before they start. The illustrious event, held on Monday, May 14, 2018, was chaired by Joe Natoli of Baptist Health South Florida. Close to $250,000 was raised to support Informed Families’ statewide prevention programs and initiatives designed to help kids grow up safe, healthy and drug free. 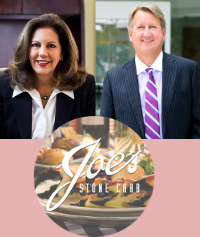 400 guests attended the dinner, which was complete with local celebrity sightings, a pre-dinner Street Party and of course Joe’s signature stone crabs, coleslaw, hash browns, key lime pie and legendary service. Several attendees who haven’t missed a Joe’s dinner were recognized with a special pin to commemorate their commitment to Informed Families and helping kids grow up safe, healthy and drug free.